SAP is the shortened form of Standard Assessment Procedure and is used to assess a dwelling's energy performance. Why do I need an SAP rating? Approved Document Part L and Section 6 of the Scottish Building Standards require an SAP calculation to be carried out to demonstrate compliance with energy performance requirements. SAP calculations are also required to demonstrate energy performance in the Sustainability benchmarks such as the Code for Sustainable Homes and in some planning conditions. When should I have an SAP assessment carried out? The earlier the better. DER/TER calculations need to be submitted to building control before work starts on site, however getting them done further in advance will allow for the energy efficiency of the dwelling to be considered whilst it is being designed ensuring a cost effective solution to compliance is achieved. EPC stands for Energy Performance Certificate and shows a dwelling's energy efficiency and CO2 emissions. An EPC will also have recommendations on how to improve the property's energy performance. Every dwelling for sale requires an EPC to demonstrate the energy performance of the dwelling. We provide EPCs for new build properties only. When can I get an EPC? An EPC for new build dwellings is an "As-Built" certificate so the dwelling should be near completion before the EPC is issued. If the dwelling is in a suitable state for an air leakage test to occur then an EPC can be issued. What is the difference between an SAP assessment and an EPC? SAP is generally a term that describes the design stage DER/TER (Dwelling Emission Rate/Target Emission Rate) Calculation, an Energy Performance Certificate is calculated from an As-Built SAP and represents the dwelling as constructed included an air test result. What information do I need to provide to get an energy calculation done? SAP calculations and EPCs require drawings of the dwelling (floor plans, elevations, sections and site plan) as well as a build specification. An EPC will also need an air test result either for the specific or similar dwelling. How do I pay for energy ratings? We charge retrospectively for SAP and EPC calculations, which means you won't pay for them until they are complete. An account with NHBC is required for retrospective billing. Do I need SAP for every dwelling on a site? SAP calculations submitted for building control should demonstrate the performance of all the dwellings on the site. Due to the number of items that will cause the calculation to vary, a large proportion of the dwellings will require an SAP assessment and builders often have an SAP for every dwelling. This also helps with a plot specific Predicted Energy Assessment (PEA) and also Code for Sustainable Homes assessments. Do I need an EPC for every dwelling? Every dwelling needs a plot specific EPC. Thermal bridging occurs where insulation cannot be continued. Non linear repeating thermal bridges are caused by wall ties and timber battens etc, and is taken into account in the u-value calculations. Linear thermal bridges occur where two different elements occur such as corners and where the ground floor meets the external wall. For more information on thermal bridging see NHBC Technical Extra 3. What are accredited construction details? Accredited construction details are a set of drawings that show how to build specific details in a dwelling to reduce thermal bridging. Building to them will result in lower heat losses through thermal bridging and lower your Dwelling Emission Rate. Other details exist that will allow you to reduce your DER further and your Energy Assessor will be able to help. What is the party wall by pass? The party wall bypass is where heat escapes from a dwelling through the cavity party wall between dwellings. The heat loss can be prevented by filling and sealing the cavity. For more information on the party wall bypass see NHBC Technical Extra 3. The Code for Sustainable Homes is a sustainability benchmark used for homes in England and Wales. Dwellings are assessed against nine categories and a level of 1-6 stars can be achieved. Code level 6 is deemed zero carbon. EcoHomes was the standard sustainability benchmark in the UK before the Code for Sustainable Homes. The last version of EcoHomes was issued in 2006 and the scheme closed in April 2012. BREEAM provides sustainability assessments for dwellings not covered by the Code, such as student accommodation and sheltered living, and non dwellings such as offices, retail, schools and industrial units. Why would I need a Code or BREEAM assessment? Both standards are voluntary. However if your development is funded by a body such as the HCA, then there may be a requirement to meet a certain benchmark against one of the schemes. Local authorities can also set sustainability targets as a planning condition which will usually have a Code or BREEAM requirement. When should I have an assessment carried out? Code and BREEAM have design stage and post construction assessments. The design stage should be carried out before work starts on site and the earlier this is done the better. Post construction assessments are done as the development progresses and includes site visits to ensure the design stage assessment is being followed on site. What information do I need to provide for a Code or BREEAM assessment? An auditable trail of evidence is required for every credit that is claimed, this can be in the form of drawings, detailed specifications, site inspections and occasionally formal letters of intent. What version of the Code for Sustainable Homes should I use? There are two current versions of the Code. The May 2009 version should be used for developments where Part L 2006 applies. The November 2010 version should be used for dwellings built in accordance with Part L 2010. Previous versions of the Code can only be used if the development has been registered to a particular version in the past. Can you send the report straight to Building Control? Yes, we do by default where you use NHBC Building Control, to save you time (unless you choose to opt out of this at order stage). We can send them to other Building Control bodies and other parties such as your Code Assessor as long as the details are provided at the time of booking in the testing work. What is sound insulation testing in buildings? A method of quantifying the resistance to the passage of sound provided by an element of the building (e.g. a wall or floor which separates different dwellings, hotel rooms etc. from each other, or a façade which insulates occupants from external noise). Sound that travels directly through a construction element separating two spaces (e.g. a separating wall between two flats) is referred to as 'direct sound transmission'. However, sound may also travel between spaces via other paths (e.g. via an adjoining external/internal wall) and this is referred to as 'flanking sound transmission'. Why carry out sound insulation testing in buildings? Building Regulations require that builders demonstrate the sound insulation performance of separating walls/floors in new-build dwellings or rooms for residential purposes (as well as those newly formed by a material change of use) where they are attached to another dwelling/building or part of the same building not exclusively used by the same occupants. The regulations set minimum performance requirements for sound insulation between spaces so as to provide reasonable conditions for living. Performance can be demonstrated either by testing a sample of as-built constructions/properties or (in England, Wales & Scotland) by registering to use Robust Details. Sound insulation testing may also be required in non-residential buildings (e.g. schools, hospitals, workplaces), where as-built performance needs to be demonstrated to ensure noise sensitive areas (e.g. classrooms, wards, meeting rooms) are suitably insulated from noisier areas. Approved Document E 2003 (incorporating 2004 amendments) sets out the applicable regulations for England and Wales. Schemes like the Code for Sustainable Homes offer credits within their assessment process for undertaking a sound insulation testing regime and further credits where measured performance exceeds the Building Regulations minimum requirements. Can I get BREEAM credits for acoustics? Yes. It is possible to get credits for acoustic performance under Hea 05 and Pol 05. We can provide design stage advice to ensure your development satisfies the relevant criteria and carry out pre-completion testing to verify compliance. When did sound insulation testing become mandatory? On 1 July 2003 pre-completion testing became a requirement for rooms for residential purposes and houses and flats formed by material change of use. On 1 July 2004 the requirement was expanded to include new-build developments and in addition, Robust Details became an alternative to sound testing. On 1 October 2010 post-completion sound insulation testing along with higher performance requirements became a mandatory requirement. However transitional arrangements were made such that testing was only required in new flats from 1 May 2011, and in houses and conversions from 1 October 2011. From January 2012 specific Robust Details that meet the Scottish performance requirements provide an alternative to sound testing. Part G is currently out for consultation. Do detached properties need to be tested? No. Only attached properties are tested. Are internal walls/floor between rooms within a single dwelling tested? No. Laboratory test based performance standards (Rw) exist for certain internal walls and floors but they are not intended to be verified as-built by on site measurement. What is the difference between Rw and DnT,w? DnT,w is an in-situ measured performance parameter which demonstrates the level of resistance to sound transmission between two adjacent spaces (both direct sound transmission and flanking sound transmission will contribute to the measured performance). Rw is a performance parameter that describes the level of sound transmitted through a single element, such as a wall, floor, door or window and it is measured in a laboratory where flanking sound transmission is negligible. The DnT,w of a separating wall or floor will typically be of the order 5 to 7 dB lower than the specified Rw for the single element, due principally to the contribution from flanking sound transmission around the element when it is built on site. Robust Details are specific design details approved by Robust Details Ltd (RDL) for use as separating walls and floors and have been tested to show their sound insulation performance. They can therefore be used as an alternative to pre-completion testing. The specific details in the RDL handbook must be followed explicitly and each plot formally 'registered' with RDL. RDL carries out visual inspections and spot check tests before completion of registered plots to check that the plot(s) meet the requirements of the scheme. Robust Details cannot be used in developments formed by a material change of use (e.g. conversions) and so pre-completion testing must be undertaken. As the specific details in the Robust Details scheme may not allow for flexibility in the design of a development or may not prove cost effective, pre-completion testing may prove a more suitable and effective route to demonstrate compliance. Approved Document E 2003 states that one set of tests is required for every 10 units in a group or sub-group. A group or sub-group is defined where significant differences in construction or layout occur. Rooms for Residential Purposes (student accommodation, hotel rooms, care homes etc) - a set of tests would usually comprise: one airborne sound insulation tests of a separating wall; one airborne sound insulation test of a separating floor; one impact sound transmission test of a separating floor. The sampling rate for testing depends upon the type of dwelling and the form of construction adopted. Either use 'Acceptable constructions' or 'Acceptable upgrading' methods as detailed in Part G, or submit test evidence of construction performance in line with the 'Similar Construction Method' option. Requirements involve obtaining a sample 'set': the mean of the result set must achieve a specific level of performance and each individual result within the set must achieve a different specific level of performance. How are plots selected for testing? The building control officer, warranty provider or other concerned parties may require you to carry out tests in specific areas or plots. However where this has not been stipulated we can advise accordingly. Where this is determined in advance of the testing, it should ideally be checked with the concerned party. Tests are usually conducted between pairs of rooms, so adjacent plots will be required. How is a sound insulation test carried out? A controlled noise is generated by an amplifier and loudspeaker across a broad range of frequencies on one side of a separating wall or floor and the noise level is measured in decibels (dB) using a sound level meter. Measurements are also made on the opposite side of the separating wall/floor (i.e. in the neighbouring dwelling) in order to determine how much of the controlled noise being generated in the source room is transmitted through to the receiving room. A calibrated tapping machine which comprises 5 metal 'hammers' driven up and down by a cam and electric motor, is used to simulate footfall noise on the floor surface. The resulting noise is measured in the neighbouring dwelling below, using a sound level meter. For both airborne and impact tests, the reverberation time (the time taken for sound to decay) is measured in the receive room and forms part of the calculation of the sound insulation performance. Will sound insulation testing disrupt work on site? During the test, high levels of noise are generated but in order to make accurate test measurements, relatively quiet conditions are needed. Anyone working in the testing area will have to leave temporarily and any noisy works in the vicinity of the test rooms will need to be halted. The time taken for testing varies with site conditions, but generally a set of tests on houses takes about one hour and a set of tests on flats between two to three hours. During the test we will need free uninterrupted access to the rooms in both properties. How do I know if I'm ready for a test? Plots should be at least at second fix stage - for further details please refer to our checklist. Sound insulation testing in occupied properties following noise complaints from residents can be carried out at any time when suitable access can be arranged. Do I need doors and windows on? Yes, all internal and external doors must be fitted and operable. We can still undertake testing but please make sure you let us know in advance so that we can ensure the correct equipment is brought to site. Do I have to inform my neighbours of the testing? If the building is attached in any way to occupied properties then it would be advisable to inform the residents as they are likely to hear the test due to high noise levels generated. In some instances tests may be required that include neighbouring properties. We recommend you check this with Building Control and request access to the neighbouring properties accordingly. Can I get some peace of mind that I'll pass, prior to testing? If you would like us to review your designs/proposals and comment on their suitability, please speak to us about our acoustic design advice service. Can I observe the sound test? We'll happily give you a brief overview of the test and demonstrate what we do, however, during the formal test(s) there are stringent rules governing the presence of personnel within various rooms so you will need to leave our engineer to it. Can you email the report to me? Yes, the completed and signed report will be emailed to you. Printed copies are available if required. Sound insulation provides resistance to the passage of sound. In buildings sound can be defined as 'airborne sound' (i.e. sound generated and transferred directly in the air by talking or home entertainment systems) or 'impact sound' (i.e. sound generated by the impact of an object striking the floor and transmitted through it, such as footfall noise). What happens if a test fails? In line with the regulations you are required to carry out remedial works to ensure the development meets the relevant performance requirements and re-test. If you don't know what to do by way of remedial works then we can advise you. You may also be asked by Building Control to test further examples of the construction elsewhere on the development in order to restore confidence and/or highlight the extent of the issue. What are the common problem areas? Performance varies for many reasons but assuming correct designs and material selection, the most common factor influencing performance is workmanship. Good detailing is key to maximising on site performance. We recommend that you appoint our expert acoustic consultants at the start of your project to review the designs, and then also to carry out one or more on site inspections during the build process to check specifically for any workmanship issues that could cause problems when it comes to sound testing. Can anyone with the right equipment do the tests? Approved Document E states that the testing body should preferably be accredited, or a member of the ANC (Acoustic Noise Consultants) and have joined their PCT registration scheme. Should I use a company without the above credentials? Absolutely not. The quality and validity of the testing and results may be questionable and may not be accepted by the necessary approval bodies. You may have to pay for testing again by a suitable testing organisation. Do NHBC carry out noise surveys? Air leakage, air permeability and air tightness are all terms that refer to the uncontrolled loss of air from inside a building to the outside and the infiltration of air coming from outside to inside. This loss or gain of air through cracks, holes or gaps in the fabric of the building is often felt to us as draughts. Achieving a good level of air tightness is important for the energy efficiency of the building. The benefits of improved insulation and more energy efficient heating systems are lost if warm air can leak out of the building and cold air can leak in. Poor air tightness can be responsible for up to 40% of heat loss from buildings. What is air leakage testing in buildings? A method of quantifying how much air leaks into or out of the building to check compliance with the requirements of Building Regulations. Why carry out air leakage testing in buildings? Building Regulations require that builders/developers prove the air tightness of a sample of new buildings on any development. The regulations set a maximum allowable air permeability measure for all buildings but the specific performance required on any given unit will depend on the SAP or SBEM calculations which determine whether the building's Design Emission Rate (DER) is below the Target Emission Rate (TER). When did air leakage testing become mandatory? Since 2006, Building Regulations in England & Wales and Northern Ireland have required mandatory air leakage testing of new homes. Regulations in England & Wales were further revised in October 2010. Since October 2010, for new building warrants, air leakage testing has been a mandatory requirement in Scotland. What sort of properties need to be tested? Approved Document L sets out the applicable regulations for England and Wales. Approved Document L1A sets out the air tightness requirements for new dwellings. Approved Document L1B states that reasonable provision should be made for continuity but no test requirements in existing dwellings. Approved Document L2A deals with new buildings other than dwellings. Approved Document L2B provides that extensions to buildings (other than dwellings) where the extension(s) is an area greater than 100m2 and more than a 25% increase in the floor area of the existing building, are covered by the requirements of ADL2A. Part L requires sample testing and sampling rates are applied to groups of dwellings that are defined as similar based on specific criteria described within the Approved Document. Part L 2010 and 2013 increases the amount of testing required to 3 tests or 50% of each dwelling type, whichever is less. The criteria for defining similar dwelling types has also expanded such that there are now likely to be more tests required per development than was the case under Part L 2006. Please note: Under Part L 2010 and 2013, plots that are not tested attract a penalty of +2.0 m3/(m2.h)@ 50 Pa in the as-built SAP, so if the target is 10 m3(h.m2)@ 50 Pa, a result of 8m3 /( h.m2) @ 50 Pa or better is needed from the tested plots to allow those units not tested to pass. For the 2006 Regulations the Building Control body usually makes the selection in consultation with the client to ensure testing is front loaded to identify any possible issues early. For the 2010 and 2013 Regulations the test regime / similar dwelling type groups are determined by the testing organisation in collaboration with the Building Control body. Plots are chosen in line with the ADL requirement of 50% testing to be carried out within the first 25% of each dwelling type. What determines a similar dwelling type is defined in detail in the regulations. How is an air leakage test carried out? A temporary airtight screen is fitted into the entrance door of the dwelling with water traps filled (or temporarily blocked), trickle vents closed (sealed under Part L 2010) and extract vents sealed. A fan is then mounted in the screen and operated to blow air into or out of the dwelling to create a pressure difference between inside and outside of approximately 50 Pa. 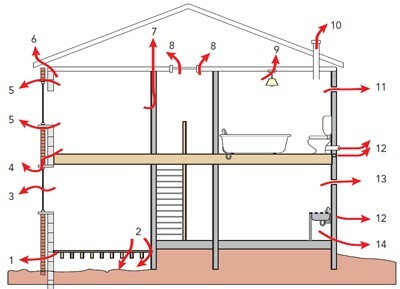 The air tightness of the dwelling is quantified by measuring the rate of airflow through the fan while a range of pressure differences between the inside and outside of the dwelling are maintained. What result is required for a pass? To pass an air leakage test in England and Wales, a dwelling must achieve ann air permeability result of 10 m3/(h.m2) (a minimum requirement in England and Wales; a recommended 'back stop' in Scotland). However, the air permeability rate (APR) defined in the design stage SAP often imposes a more stringent target. If the tested APR is greater than that used in the design stage SAP, the as-built SAP may not comply. The model specification used for Part L 2013 (England)* and Part L 2014 (Wales)** both assume an APR of 5 m3/(h.m2) so designers specifying the minimum required APR value will need to compensate by increasing performance in other areas of the specification in order to demonstrate compliance. A test that does not achieve a Building Regulations minimum performance requirement would be classed as a fail. Should tests fail to achieve the necessary performance level, the property may need remedial work and re-testing. You may also be asked to test further examples of that dwelling type to restore confidence and show that remedial actions have been carried forward into the remainder of the build. *Part L 2013 (England) comes into force on 6th April 2014 for buildings built in England only. Will air leakage testing disrupt work on site? The time taken for testing varies with site conditions, including the complexity and size of the individual units, the number of units to be tested etc. The actual testing where readings are taken takes only around 15 minutes. We work with you to ensure minimal disruption on site. Testing needs to take place in the final stages of construction when all dirty works have been completed and the site is clean. We will provide you with a checklist, in advance of testing, to let you know what needs to be in place and when. We can still undertake testing but please make sure you let us know in advance so that we can ensure the correct equipment is brought to site. The fans used for this type of testing require a significant amount of stable power and portable generators are often not sufficient. We can carry out pre-testing site visits and early testing to see that the units are on track to meet their targets. Talk to us about your requirements. Will I get the results on the day? Yes, we will give you preliminary test results on site to allow you to immediately demonstrate the measured performance to other parties and we will follow this up with a full report and test certificates within 5 - 7 working days of your test. When using NHBC Building Control and/or our Energy Rating services we can share this information with them to save you time and speed up clearing of conditions and production of EPCs (unless you choose to opt out of this information sharing at order stage). Yes, we do by default where you use NHBC Building Control, to save you time (unless you choose to opt out of this at order stage). Also, where we are providing your Energy Rating services we can send your report to colleagues to speed up the process for you receiving EPCs. In line with the regulations you are required to carry out remedial sealing to ensure the development meets the relevant performance requirements and re-test. Our test engineer will often be able to provide remedial advice and identify the air leakage paths on the day of the test. You may also be asked by Building Control to test further examples of the construction elsewhere on the development in order to restore confidence and/or highlight the extent of the issue. Depending on the nature and extent of the leakage paths, we may be able to re-test on the same day or if not, come back to site at a later date. at socket points and around electricity consumer units. Approved Document L states that the testing body should be registered with BINDT. NHBC are members of ATTMA (Air Tightness Testing and Measurement Association) and associate members of BINDT. Many of our engineers undertake testing for air and sound on the same visit. Should I use a non-accredited company? Absolutely not. Your reports will not be accepted by the necessary approval bodies and you may have to pay for testing again by an accredited company.